The cofounder of Google Voice is back for more. And he’s hungry. Back in May we reported on Firespotter Labs, a new incubator started by GrandCentral cofounder and CEO Craig Walker (GrandCentral was acquired by Google in 2007 and relaunched as Google Voice in 2009). Walker left the Google Voice team in late 2010, did a stint as an Entrepreneur in Residence at Google Ventures, and laid the kindling for Firespotter — which included closing a $3 million funding round led by Google Ventures. And now, just a few months after it closed that funding, Firespotter is launching its first application: an application called Nosh, which makes it easy to share snapshots of the food you’re eating with your friends (it does some more useful things too, so read on). It’s equal parts Instagram, Yelp, and Foursquare, with a few unique dashes of its own. The app has just gone live for both iPhone and Android — and there’s also a slick web version too. The basic premise behind Nosh is that people like to share what they’re eating with their friends (just look at your Instagram or Twitter feeds). And they also like to know what they should eat when they’re at a restaurant. Nosh makes it easy to do both. When you first launch the app, you’ll be prompted to connect with your Facebook and Twitter logins, so that you can quickly build up a list of friends who are also Nosh’ing. From there, you’ll have a few options. The most important one is the ‘Nosh’ — the service’s equivalent of a check-in. The idea is that you go to a restaurant, take a photo of what you ordered, and leave a quick review and/or remark about it. 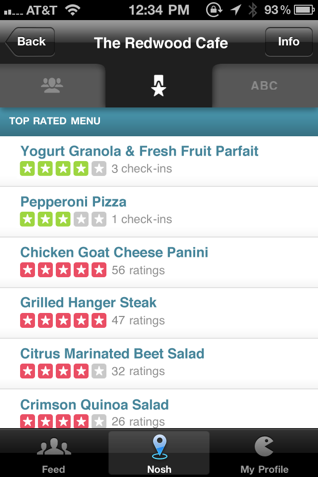 The app includes the standard ‘nearby venue’ listing, to help making finding the restaurant a snappy process. Another important feature is the Feed. This is a lot like what you’d find in Instagram, Path, and other photo sharing apps: tap it, and you’ll see a stream of photos your friends have recently taken of their own meals, along with their own reviews and comments about their meal. But Nosh isn’t just setting out to help you share and view photos of food — it’s actually useful. The company currently has a team in India ingesting thousands of menus from restaurants across the United States (they’re using some technology built in-house to do this quickly, so it isn’t just manual entry). The idea is that when you go to check into a venue, you’ll also be able to see which meals a restaurant offers — and they’ll include reviews left by other Nosh’ers. In other words, it’s sort of like a Yelp for individual dishes, as opposed to the restaurant itself. I’ve been trying the app out for a couple of days (though I don’t have many friends on it yet, obviously) and it’s well done. It looks good and is generally polished — and once there are more meal reviews, it could be genuinely useful. My only major gripe: at this point you can’t snap photos of things you’ve cooked at home (all photos are currently associated with a venue), but this feature will be added in the next version. In the mean time, you can create a new venue called ‘Home’ if you really want to. Most of the things Nosh is doing aren’t exactly novel (Foodspotting also revolves around taking snapshots of dishes at restaurants). But it’s bundling them up nicely — and the fact that it actually has some utility (figuring out what to order at a restaurant) as opposed to just being a fun diversion could keep users coming back to the app, which is always the biggest hurdle as these services get off the ground. And while he’s excited about Nosh, Walker says that Firespotter has more in the pipeline — he hopes that once the team is running at full speed, they’ll be shipping three or four new products a year.